View of “Jacky Connolly and Flannery Silva,” 2015. From left: Jacky Connolly, Hudson Valley Rock Chick, 2015; Flannery Silva, Angels’ Den, 2015; Chloé Doll, 2015; Valley Basket, 2015. The scene is twilight, the leaves are turning, and a girl logs practice time on her acoustic guitar in an animated world shot within the 2009 PC game The Sims 3. Tear-like droplets ambiguously fall from characters’ limbs throughout. Living in a house upstate with a smaller, surlier missy in Jack Skellington logo apparel, no one speaks, but they do bake calzones in their living room and have an ice-skating rink in the picturesque backyard. 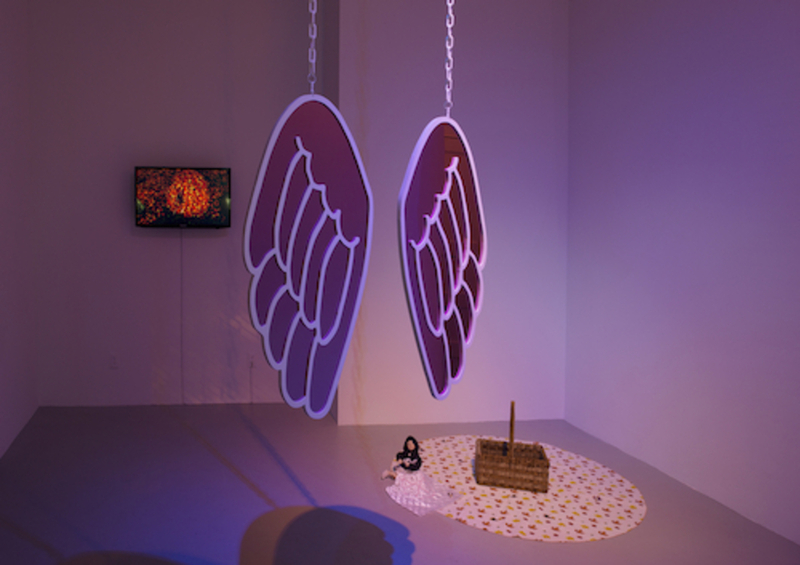 Jacky Connolly’s two videos—articulating this rustique mise-en-scène of lonely utopia—Hudson Valley Rock Chick and Forever Alone Calzone (all works 2015), are mirrored by Flannery Silva’s sculptures of a ready-loaded doll and American Girl brand accessories. The show is a tag-team adoration of materials and references straight out of the attic-stored pasts of artists who spent some crucially formative years far from IRL, burrowing deep by turns into commercial and intimate fantasies. To wit, see Silva’s Chloé Doll, whose titular figure is nestled in a similar Jack Skellington sweatshirt to that seen in Hudson Valley Rock Chick and sits frozen in the act of needlepointing an anarchist A onto a quilted satin blanket on the edge of an autumn-leaf patterned tablecloth from Rite Aid sporting finessed (and fake) cigarette burns. The personal pastoral as commercially inflected ready-made: Just plug in your own memories, and the work will get to work on you. A constant wind blows throughout Connolly’s videos of roughly rendered characters uneasily coexisting each evening, while Silva’s woven Valley Basket sits empty on the aforementioned seasonal spread—these pieces are cold. But the show’s lighting bathes the floor-bound sculptures and ceiling-suspended, wing-shaped mirrors in a warm, lilac twilight. A liminal mood for those not bound on forgetting the waning textures of yesteryear.